On what would have been Packie Manus Byrne’s 100th birthday, friends and family of the legendary folksinger, musician, songwriter and storyteller from Donegal are gathering in Ardara to celebrate the life, songs and music of an extraordinary man. Born on 18th February 1917 in Corkermore, Packie spent much of his life in England, where he had quite an impact on the folk scene. He returned to live in Ardara when he was in his early seventies and it is here that friends from all over the world plan to meet to remember the 100th anniversary of his birth. Despite several bouts of ill health, Packie still managed to celebrate his birthdays with an evening of music and song right up until his 98th, two years ago. On one such evening, Packie invited everyone present to come back in 2017, on the occasion of his 100th birthday, though he added with a mischievous grin that some people might not last that long. Sadly, he was correct, but that won’t stop the celebrations continuing, so on the weekend of 17-19 February, the Packie Manus Byrne Centenery Weekend will continue the tradition of his annual birthday party, and many will gather to honour the man and his musical legacy. As well as more informal singarounds and sessions taking place in the town, the weekend will feature a 100th Birthday Concert in the Nesbitt Arms Hotel on Saturday 18th February at 8.30pm, where many of his friends will sing the songs and play the tunes Packie wrote over his long career. There are also plans to make a special recording of as many of his songs as possible over the weekend, and to release these in a DVD in the following months. 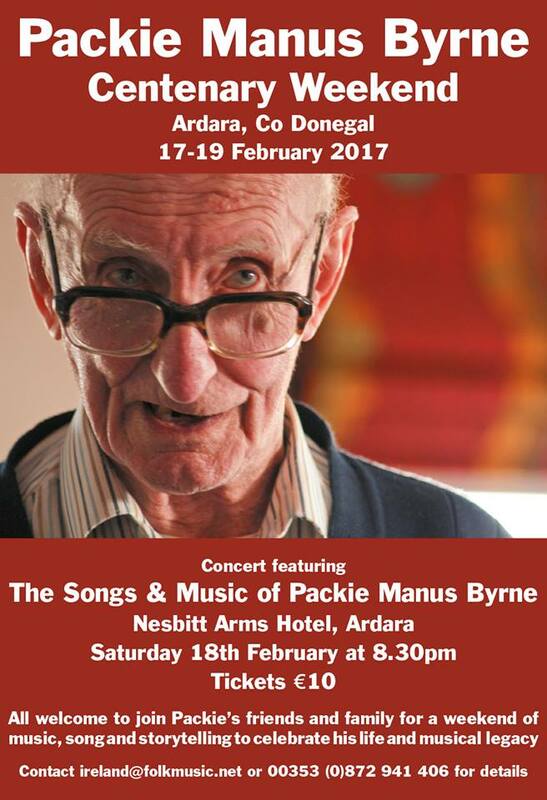 All are welcome to Ardara to join in what will be a great weekend of song, music and storytelling in honour of the legendary gentleman that was Packie Manus Byrne. For more info contact: ireland@folkmusic.net or 00353 7495 37967 or 00353 8729 41406.